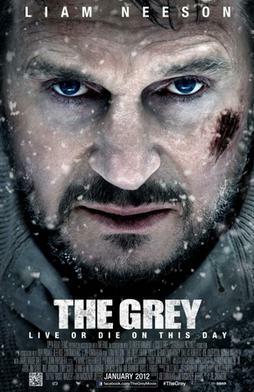 So, I was poking through Netflix tonight and ran across the Liam Neeson film “The Grey” and thought, hey, why not. I would have been pretty pissed if I’d paid theater rates to see this. I’m not a big fan of the Batman films he’s been in, or some of the others, but normally I enjoy movies with Liam Neeson in them. Well, not this time. I’m saddened to say this film was horrible. I can understand the need for suspension of belief in some of these movies, but really? This one was bad. I should have researched the Director Joe Carnahan before watching. He’s made such literary masterpieces as “Blood, Guts, Bullets and Octane“, Mission Impossible 3, Narc, and Smoking Aces. Talk about not being my types of movies. Scenario, bunch of rough necks from up in Northern Alaska crash in a plane killing most. Then the big bad rabid wolves attack slowly killing off others. They leave people behind to die, they never once build any type of shelter from the cold ( even though several die from exposure), they fall in a river and don’t bother to dry off, just keep trudging through the snow. It’s really bad. Oh well, hopefully Liam will make a better film next time.